While minister of state for information and broadcasting Rajyavardhan Rathore openly stated after the June 9 operation that Indian forces crossed into Myanmar and raided two militant camps, the gallantry award citations of the heroes of the strike make no mention of the neighbouring nation, indicating instead that the operation took place in Manipur and Nagaland. ET has learnt that the citations for the eight soldiers, including Lt Col Nectar Sanjenbam who led the operation, give an insight into the carefully carried out raid, while blurring out that it took place in Myanmar. Lt Col Sanjenbam, who has been awarded the Kirti Chakra — the second highest peacetime gallantry award — is learnt to have displayed unusual prowess in taking down the sentries at the militant camps that were raided. The officer is cited to have taken down 6-8 sentries, who were guarding the camps, personally in close quarter combat, before blasting his way through the main installations. Similarly, Hav Tanka Kumar Limbu, awarded the Shaurya Chakra, is also cited as being instrumental in ensuring that the crack commando team sneaked in undetected before blasting away the main compound.The citations indicate that the Indian Army managed to inflict close to two dozen casualties, even though a precise number is not mentioned. On the eve of Independence Day, the government conferred gallantry awards to eight soldiers of the 21 Para who took part in the strike but kept the citation — or record of the operation — classified. This was an unusual move as in the past, gallantry citations are made public, even for actions in foreign lands. 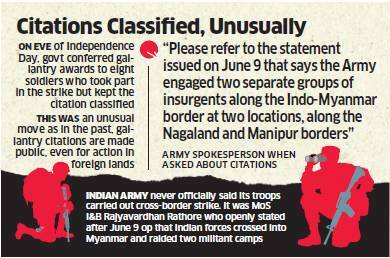 When asked about the citations, an Army spokesperson said:"Please refer to the statement issued on June 9 that says the Army engaged two separate groups of insurgents along the Indo- Myanmar border at two locations, along the Nagaland and Manipur borders." It may be recalled the Indian Army never officially said its troops carried out a cross-border strike. In a statement issued on the day of the operation, the Army was careful to mention that the operation took place "along the Indo- Myanmar border" and that "we are in communication with the Myanmar authorities on this matter".